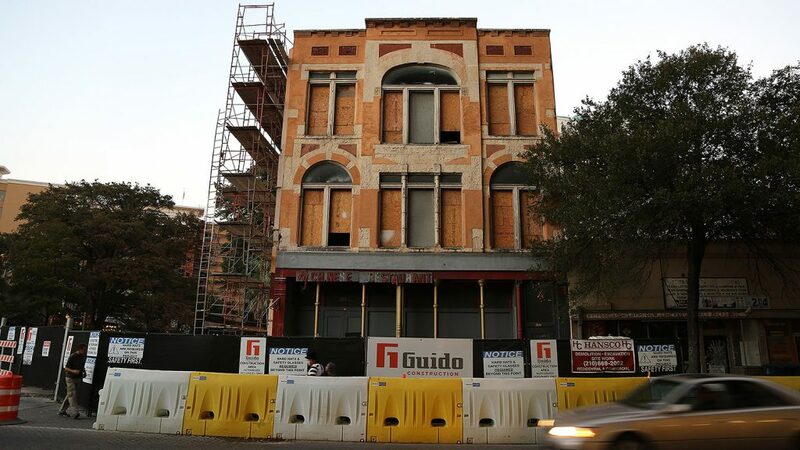 The $7.5 million rehabilitation of the Witte building on East Commerce Street—aka, the Chinese restaurant—is well underway. Esquire Tavern owner Chris Hill is rehabbing the 1890s building to hold a tiki bar on the River Walk, an Asian restaurant on street level, office and event space, four micro-apartments on the top floor, and a new public staircase and elevator from the street level to the River Walk. Houston Eaves, beverage director at the Esquire Tavern, will lead the tiki bar; Myles Worrell will serve as head bartender. Hill has hired Jill Giles to design the interior. He’s still looking for an operator. The four units will be around 300 or 400 square feet with 14-foot ceilings and balconies. “We think it’s going to be under $1,000 a month,” said Hill, who declined to give the overall cost of the project. The second floor will consist of 1,000 square feet of banquet and event space. The project is receiving a portion of a $5.3 million incentive grant from the Houston Street Tax Increment Reinvestment Zone. It’s also receiving something called the Riverwalk Capital Improvements Reimbursement Grant worth up to $1 million for the stairway and elevator improvements. Other incentives include $137,910 in SAWS impact fee waivers, $21,000 in city fee waivers, and an Inner City Incentive Fund Grant worth $800,000. Hill anticipates completion in exactly one year. It’s the same timeline as the Witte’s sister project, the 22-level Canopy by Hilton down the block at Commerce and St. Mary’s streets. Setting It Straight: A previous version of this article misspelled the name of The Esquire Tavern’s beverage director. It’s Houston Eaves. You had me at Tiki Bar. When did that Chinese restaurant close? It has been there forever but I don’t think I ever remember seeing it open. It’s good something is finely being done with the building. Thanks Chris for taking on a very difficult and complex project that will preserve a piece of San Antonio’s Victorian past! I did a school project involving the facade facing the river of that building. Happy to see that building is getting a built out.